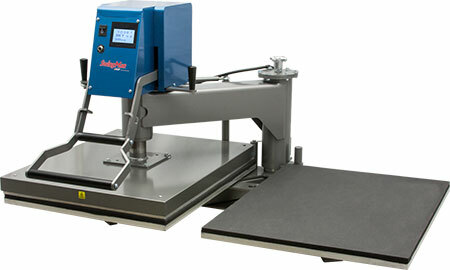 The Swingman 25 Twin heat press is work horse with its heavy duty swing away heat press features and innovative dual lower platen system which is interchangeable with smaller or custom lower platen systems. Allowing the operator to prepare the next product/print while the other station is transferring the image. With a 20" x 25" straight up and down heat platen, this machine has been designed to apply transfer to tiles, plaques, mouse pads, shirts, etc, in any volume! The over center lock down handle provides easy clamping. The rear mount pressure adjustment is capable of producing more downward force than any other standard 20"x25" manual heat press. The built in pivot bearing allows smooth and accurate motion to both platens. This heat press is a must have for the production user!